Finally we did the 'HEMELS' piece, it was done in a week or so. 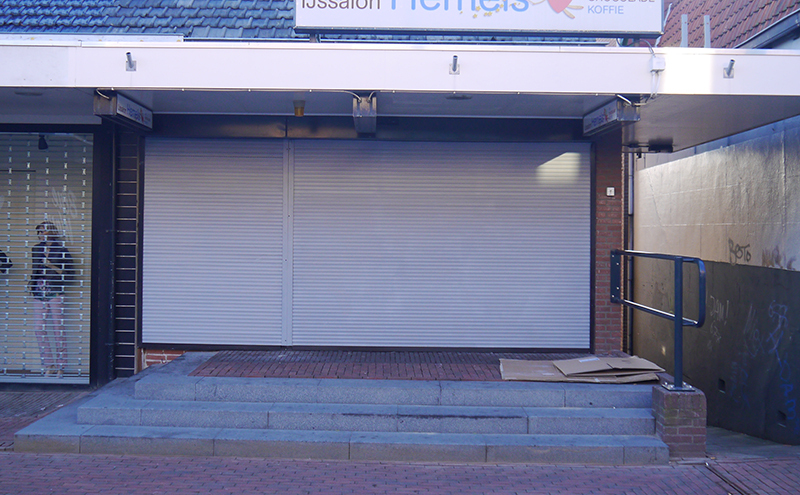 Because of the material we had to paint on (we had to paint an aluminum roller shutter), we had to take some extra steps. 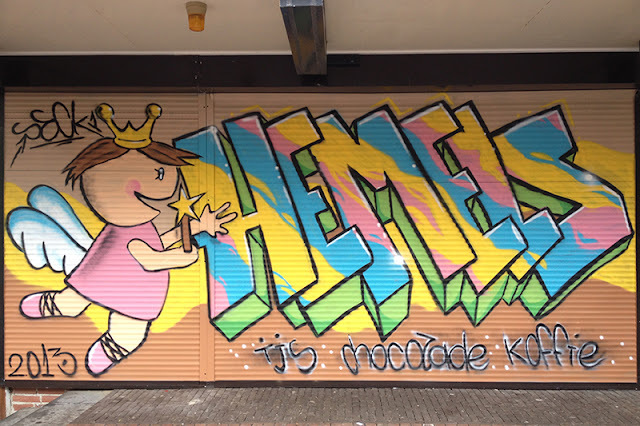 I want to thank the Hemels' crew for being so friendly. The mails and the conversations we had about this project were always pleasant and with a positive put in. This was a great opportunity to gain fame. I also loved the shop, and the ice cream is delicious! Offcourse its handmade with love. So the sketches are done, the supplies are in but.. We had to take some steps to get the paint to stick onto the surface. In the 'investigation' I did to get to know more about the aluminum and the paint I use, most people said it was very hard to paint aluminum. We did setup a plan, so in the first day we decided to clean up the surface, get rid of the old 'tags' that were on, and sand it a bit to get the paint to stick on. 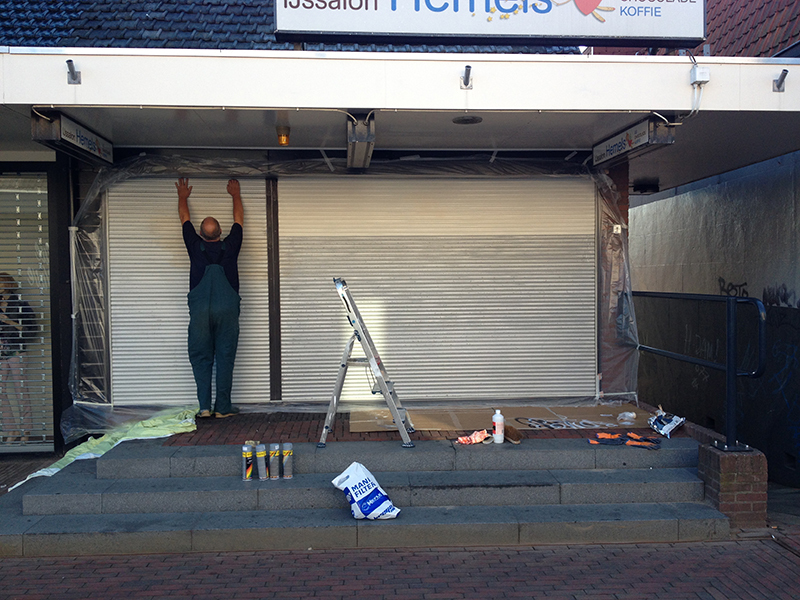 We started early again because we had to paint the base coat, and the shop opens up around 1 o'clock.. We sanded the pole in the middle again, because it was a silicone based paint. After dusting off the surface we tape it all up and get the primer up. This is starting to get more like it! 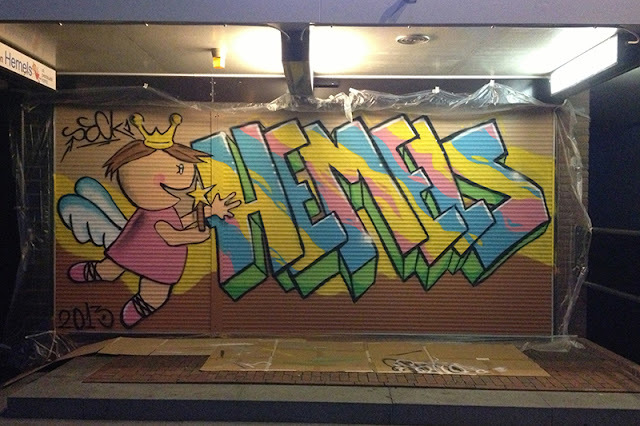 Allright, the day to make a good start on the 'HEMELS' graffiti! First off, paint the basic sketch, the rest of the fill was a piece of cake. Just when I wanted to start the outlining it was 11 o'clock already and the paint has to dry for about 2 hours.. So we decide to play it safe, packed everything up and decided to finish tomorrow. In the afternoon I made a list of 'imperfections'; Things I have to repaint to make whole fill covering. The fill was already done mostly, me likey! The fill has been done. We later decided to finish the outlines in the evening, so we wouldn't have to stay off work the next day. Cor had his focus on the finish, so I have learned a lot these days about sanding and cleaning.. Lucky as we were, it was a nice evening to paint. The outlines always make it pop, and with the highlights it became even more crisp. It was as expected but I am really proud of the outcome! Picture shot right after the last outline. The only thing left was the text about the ice cream, chocolate and coffee right? 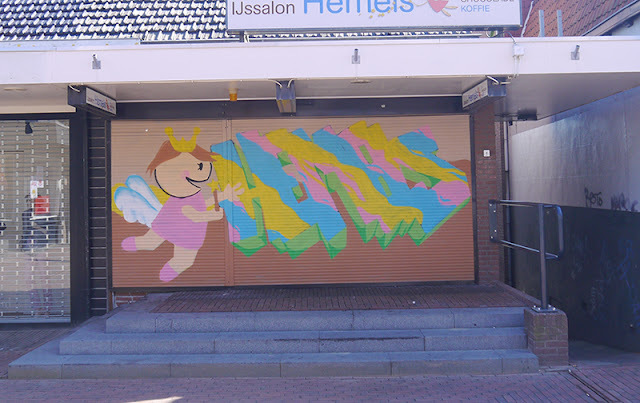 In the sketch I wrote it in English, but after all the environment checkups (I watched the people walk by, most of them were old ladies or old men that 'didn't like this type of art') we just keep it simple.. Dutch, as everyone in my town understands. One last step, a little change, and we were done! I really want to thank ijssalon Hemels Barendrecht, it was a nice opportunity. Together with my dad, famous for his vmquest78 blog, we gained a lot of experience! I loved most of the reactions from the audience, I even heard someone say 'Oh that is Hemels, the ice cream parlour', and that was when I wasn't even finished.. Nice! Love to all followers, keep in touch!